Not long ago, we had a question about suggestions on how to encourage communication with the younger, or future, generation of owners in a family about intergenerational transfer possibilities. The question could have as well been from the future generation on how to begin to communication with the current or older generation about the same issues. Below are some suggestions we have used in our Landowner Legacy Communication© seminars. All come from our own experiences and from those of families with which we have worked. A few of the suggestions are in this post with the remainder in a subsequent one so check back later for the complete list. Involve the next generation before it is too late! Two questions that are asked in many of our Landowner Legacy Communication© workshops, is “how do I get my children involved in our land” and “how did the Nippers do it.” In reality, they are the same question. In my opinion, if the current generation will consider many of the items in the list below, it will improve their chances of a successfully involving the next generation. Do it now! Don’t wait. Waiting increases the probability that the details of your family’s transition will not be at your disposition, but at someone else’s. Do not assume the next generation is or is not interested. Ask them! Listen to what they say. Write down their suggestions. Do treat sons and daughters the same. Do not assume daughters are not interested because they may be the most important ones to be involved. Do establish goals for the family and the land with input from the next generation. Do not suppress any attempts the next generation makes to open the discussion on transitions. Do think globally and be very open to all suggestions. Do answer all questions about any transition plans and opportunities even if th ey are difficult to explain. Do take the responsibility of identifying assignments related to the land and its management to which the current generation can take meaningful ownership. Do expect the next generation to be responsible for any assignments made and accepted. Do not get hung up on the small details and not accomplish anything. Do enc ourage the next generation to participate in self-improvement and education related to the land. Do develop fun activities with the next generation on and about the land. others. Wealth does not have to mean financial wealth; it could be knowledge, experience, tours, stories, pictures, etc. Remember the more the next generation is involved now, the more the future shape of the family Tree Farm is established. Photos courtesy of clctrust.org and NMS. Dirt is just dirt, or is it? Lately, we have been spending a lot of time learning and reviewing our soil’s (polite way to say dirt) effect on our tree farms and their timber crops. Soil types, soil maps, site index, nutrient levels, erosion potential, suitability for supporting forestry operations, and on and on have been part of those discussions and considerations. While all of those are important, and while we try to make sure everyone in the family has some knowledge of the soil, the one overriding issue above all the scientific aspects is . . . . . . . .
. . . the dirt under our fingernails is the same dirt that was under the nails of our great-grandfather, grandfather, and father. In order to make a living, both my family and Allen’s family for the last 75 or more years have worked the same soil we now work. 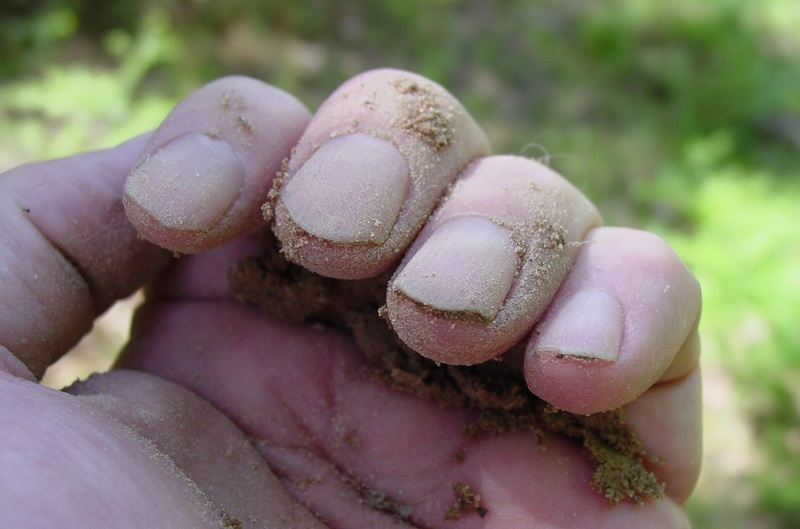 Whether they grew timber, cotton, cattle, or whatever is not so important now, but it is special to know that our hands are “soiled” by the same DIRT that our ancestors had on their hands. And our children and grandchildren have that same dirt under their fingernails as well. While dirt may be just dirt to some, this dirt is special to us! And because it is special, we do everything possible to protect it. Thank you to everyone that attended and supported our American Tree Farm Tour. It was a successful day with more than 60 individuals attending, and more importantly, we were able to finish the tour before the rain started! We especially appreciated the attendance by representatives from the offices of Representative Tom Cotton (R, AR-4) and Senator John Boozman (R, AR), which indicates their commitment to Tree Farm and private landowner forestry operations. Almost 60 percent of those attending were private landowners just as we are. Those attending represented over 8,000 acres of timberlands and were from Arkansas, Louisiana, and Texas. A special thanks goes to our family for all their support, help, and participation in the planning and execution of the tour. If you want more information on any of the topics discussed, please let me know. It is always good to get comments from attendees, and while I probably should not brag, we did get some excellent ones. Below are those we heard or received in a written form. If you were not able to attend the Tree Farm tour and would like to visit our Tree Farms, please contact me. Below is a group of pictures taken during the tour by various individuals attending. Thanks to all of those that contributed these pictures. Ginny, Emilie, Abigail, and William help folks register before the Tree Farm Tour begins. Allen and Ginny welcome everyone to the Nipper Tree Farm. Allen discusses management plans for individual family tree farms. Wade Hargrave explains what he does for landowners as a consulting forester and prescribed burn manager. 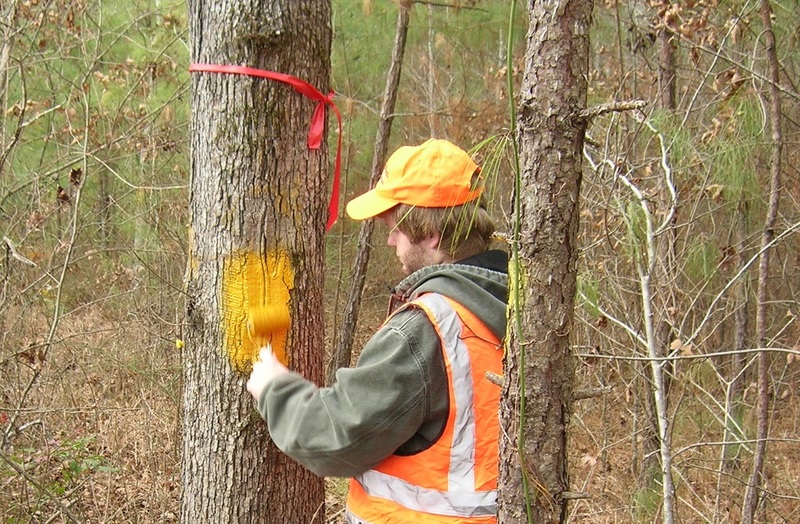 Being safe is an important part of the risk management startegy of a Tree Farmer. A whistle carried with you in the woods can be important means to alert others if you are injured or hurt. The group walks to a growth plot that is used to monitor tree growth. Right after her father, William, discussed how to take water samples, Abigail decided she wanted in on that action as well. Her mother, Elisabeth, also jumped right in with collecting water samples before she married William. Josh Smith discusses a demonstration prescribed burn. Fire lane along the side of the demonstration prescribed burn. Caroll Guffey, Cooperative Extension forester, provides information on diseases that kill pine trees. Allen and Josh listen as Weldon discusses boundary marking including the role of the tree behind them. Sign built by Joe Friend and installed by Josh Smith and his AFC crew. I was about ten years old on my first trip to our timberlands. Not long after that, I recall thinking “How am I going to remember where all this stuff is?” as we drove and walked to the various tracts. We twisted and turned our way around single lane back roads, all the time my dad talking about various forestry topics, and to be quite honest I was lost in more ways than one. However, over time and many, many more trips to our land I started picking up on where each tract was, the names of the individual tracts, the ways in and out, and so on. This was especially important when I turned 15 and could drive my dad to the land on those early mornings. Many times he would nap during the trip so I had to know where to go! While the repetition of going to the land and working on various tasks helped me learn, it was the getting involved with the overall operation that really got me interested in what was going on. Follow our Blog via Email ! You know you are a Tree Farmer when . . . .